On this Christmas Eve, I decided to take a trip to the Starbucks closest to Battery Park in Lower Manhattan. 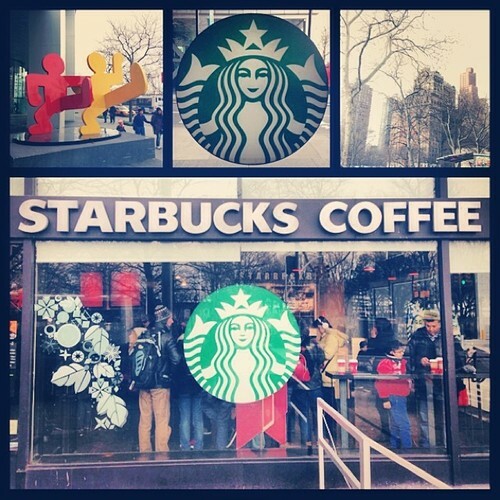 This Starbucks is on the corner of Pearl and State streets and is located directly between Battery Park City and South Ferry. When I emerged from the subway station, I was surprised by the desolate looking Battery Park that expanded far toward the water. Then I turned around and the familiar skyscrapers and construction scaffolding reassured me I was still in Manhattan. Although the park is not much to look at now in this winter blight, I’m sure it is a pretty sight to see in the spring. The Starbucks that lies across the street from the park is large and crowded. The line inside is mostly tourists but I can also pick out a few locals that are most likely coming from or going to Staten Island. Although there is plenty of space, there is only seating in the back area furthest from the barista bar. There is also a bar lining the exterior walls in the front but no high tops to go with it — probably because they would just make the place even more crowded. After all, no one likes to sit down with a constantly shifting crowd pressing at their backs anyway.